Deerfoot Moss is very similar to Reindeer Moss. It is a greyish-green, sponge-looking moss that gets its' name because it looks like the foot of a deer. 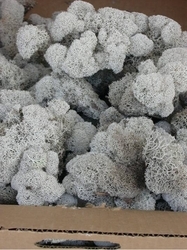 This item comes in an 12x12x12 box that typically holds between 7-8 Square Feet of moss.